Power management firm Eaton has landed a multi-year partnership with Manchester City, becoming the football club’s official home energy storage partner. The partnership will see the launch of a limited edition of Eaton’s xStorage Home energy storage system which it has developed in partnership with, and using second life batteries from, car manufacturer Nissan. The limited edition differs in design from the original xStorage product, coming in Manchester City’s blue and white colours with a City crest on the front. The first units of the xStorage system are now expected to ship in July. Eaton said it would benefit directly from a joint marketing programme reaching the fans of Manchester City throughout the UK, while the football club said the deal reflected its “outstanding commitment to sustainability and energy efficiency”. 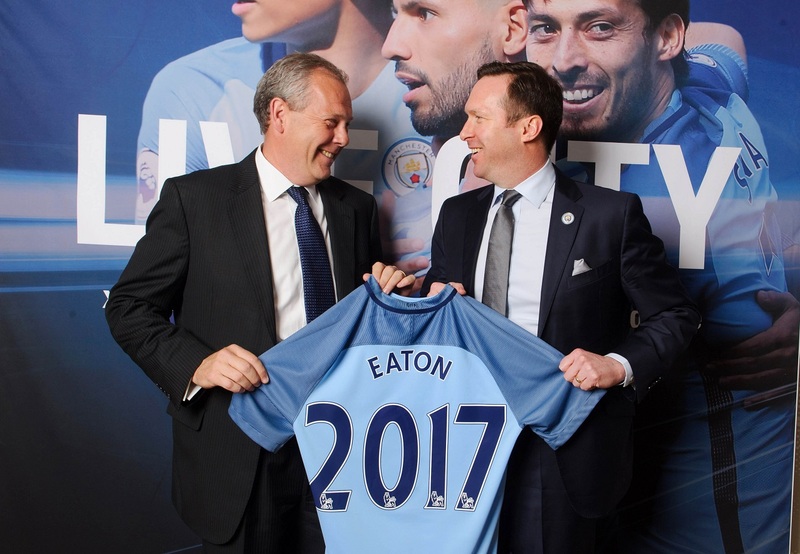 At a launch event this morning in central London Frank Campbell, president of EMEA at Eaton, admitted that it was a “relatively strange pairing” of a professional football club and a power management company, but said Manchester City was “exactly the kind of people Eaton wanted to partner with”. Specific benefits of the partnership between the two entities were not made immediately clear, with City Football Group chief commercial officer Tom Glick referring on a number of occasions to Eaton being granted access to the football club’s extensive media channels. 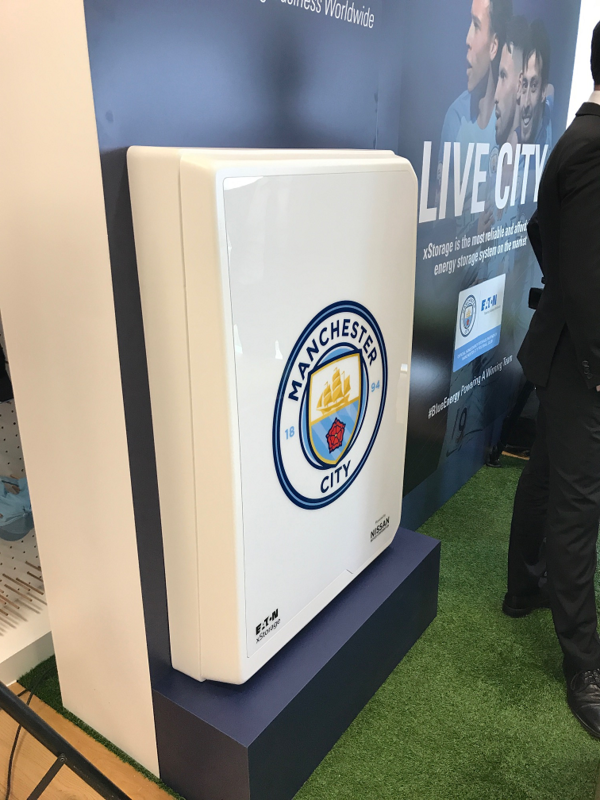 A promotional video shown during the launch event included Manchester City footballers Gael Clichy, Aleksandar Kolarov and Fabian Delph mentioning the various benefits of a home energy storage system. Representatives from Nissan and Eaton were however on hand to discuss specific details of the xStorage product, initially launched late last year. When pre-orders were opened in December, second-life batteries were announced to start at prices of £3,000 and brand new batteries starting at around £4,200. However at today’s event the duo revealed that prices had now increased, with the entry-level 3.5kWh second-life battery now starting at £4,250 excluding VAT and installation costs. When pressed on this increase by Solar Power Portal, Eaton’s Stephanie Ordan explained that the new pricing reflected costs associated with distribution. Eaton revealed it had lined up various distribution partners for the expanded range of batteries – increased from the six revealed in December to a current nine versions – arguing that it was not the kind of product you could “merely pick up at a DIY store”. Eaton is now looking to expand on its network of certified installers and stated ambitious aims of having two installers in every post code to carry out the work. These will be trained either at a central education centre in Bedford or at education events conducted elsewhere across the country. Various funding and leasing arrangements were also discussed at the event. A typical scenario described by Eaton included a 4.2kWh battery being installed on a three-bed house in central England with a 3kW rooftop array. Savings from the install of a battery were estimated to amount to £43 per month, with an additional £23 per month said to be available through the batteries offering frequency response services to the national grid. If a financing model was arranged at around £100 per month, Eaton explained the net cost to consumers would be around £20 to £40 per month, however the firm claimed some installations in the south of the country would already be profitable.